The global dental implants market bears a highly consolidated vendor landscape, says Transparency Market Research (TMR) in a recently published report. This is solely because of the existence of small -scale vendors in the dental implants market. Zimmer Biomet Holdings, 3M, Straumann Holding AG, Health Care, Danaher Corporation, Health Care, AVINENT Implant System S.L are top companies working in the global dental implants market. A key strategic alliance adopted by players in the global dental implants market to outshine their rivals is constant development of new products and innovation of products. These players are also focusing on improving the quality of their products along with signing agreements with important selling entities. Medium-sized vendors in the market are looking out for opportunities to collaborate with larger players for improving their revenue index. They are concentrating on delivering highly efficient products and expanding their manufacturing capacity to steal a march over competitors. According to experts from TMR, the global dental implants market is expected to gain revenue worth US$6.54bn by the end of 2025. The market stood at US$3.60bn in 2016. Experts project this growth to occur at a promising CAGR of 6.90% during the forecast period from 2017 to 2025. Among the various end-users in the market, dental clinics segment is expected to boost the global dental implants market during the forecast period. This is because of the rising preference of consumers for dental clinics. Region wise, Europe is expected to account for a leading share in the global dental implants market in the coming years. This is attributed to a flourishing healthcare industry and also technologically-advanced treatment platforms for periodontal diseases. Dental implants are a common dental treatment for people who have lost their teeth because of periodontal injury, disease. This treatment is a replacement of tooth roots. Dental implants is mainly an implantation of metal such as zirconium and titanium into the jawbone underneath the gums. Such implants help the dentist in mounting the replacement teeth over them. Such USPs are driving the global dental implants market. Apart from this, rising aging population and growing awareness about maintaining oral health are also fueling demand in the global dental implants market. Furthermore, there are several types of dental implants available in the market such as endosteal implants, subperiosteal implants, intramucosal plants, and transosteal implants. Rising incidences of various dental diseases, and growing demand for cosmetic dentistry, and rising popularity of dental tourism are the major factors for propelling growth in the global dental implants market. Along with these, rising aging population is also bolstering growth in the global dental implants market. A few challenges hindering the growth of the global dental implants market are weak reimbursement policies of healthcare sectors across the globe, and limited reimbursements for dental implants surgery. Nonetheless, the sluggish growth rate of the market is compensated by persistent demand for crowns, bridges, and overdentures. This is believed to help overcome this challenge in the near future. 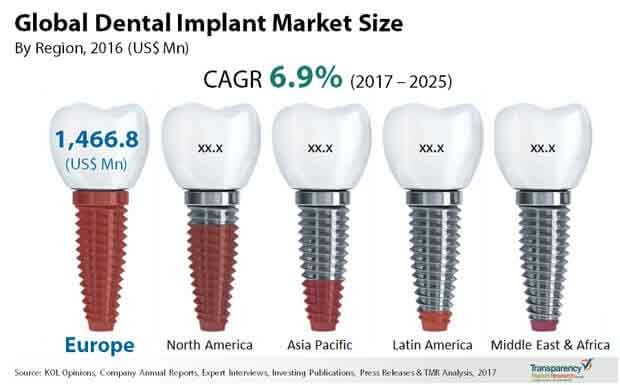 The review is based on a market research report by TMR, titled, “Dental Implants Market (Product - Endosteal Implants, Subperiosteal Implants, Transosteal Implants, Intramucosal Implants; Material - Titanium Implants, Zirconium Implants; End User - Hospitals, Dental Clinics, and Academic & Research Institutes) - Global Industry Analysis, Size, Share, Growth, Trends, and Forecast 2017 - 2025”.